When it comes to the food group, fruit can be called the candy of the food world. But they are not like the artificial man-made candies in that their sweet flavor is natural. They also supply lots of nutrients and vitamins that provide benefits to your health. But the sad thing is that fruits nowadays can be covered in wax. Such wax contains ingredients which are the same as those found in motor oil. They can affect your health in so many serious ways. So What are Fruit Wax Coverings? Today many fruit farmers and manufacturers use special wax coating for covering the fruits. This helps in preserving them. The process involves first removing the natural wax which covers the fruit by washing it off. The fruits, like apple and orange, are then coated with this petroleum-based wax. The manufacturers give a unique excuse that the wax helps in preserving the fruit and preventing build up of bacteria and fungus. But the underlying truth is that the wax is actually used for adding color and to provide a more pleasant look to the fruit. This has raised questions from people if this is being used to get them to purchase more of these fruits or just to keep the fruits fresh. Many controversies are related to the ingredients used for making fruit wax. Unfortunately, there is no need for companies to declare the ingredients in the wax because it is not classified as a food ingredient. But it has already been revealed that various types of such waxes have allergens like soy, dairy and gluten in them. The more traditional types of wax coatings have fungicides and preservatives in them. Many times they have also been found to have artificial dyes and coloring intended for enhance the looks of the wax. So many dyes which are widely used in food products are found to be related to increasing the risk of cancer development. So How Can You Avoid Harmful Fruit Wax? It is well known that the most traditional wax coatings have ingredients which cause harm to human health. 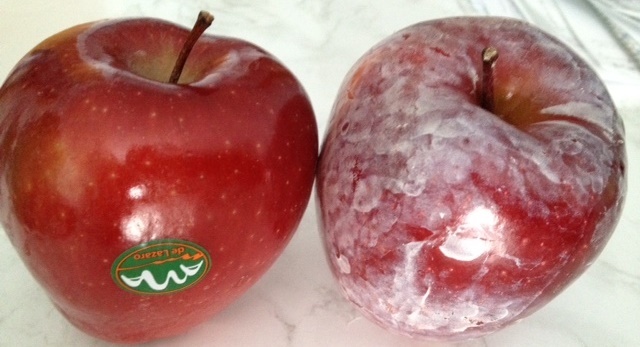 But some produce-distributing companies are using only natural-ingredient containing wax. There are organic fruit waxes which have only natural ingredients like beeswax, carnauba wax and wood resin. Palm tree leaves are used in making carnauba wax. Such waxes are also free from artificial preservatives, fungicides or petroleum-based ingredients. You should start eating fruits which have nothing else but their own natural wax to cover them. These types of fruits are available in farmer’s markets and only during the season. When you buy them, you are also assured about the absence of any added preservatives.